Disability parking permits are issued to students, faculty, or staff who have either a permanent or temporary disability and require accessible parking. These permits authorize parking in spaces designated for use by disabled drivers. Disability parking privileges are for the benefit of the registered permit holder only. For permanent disability parking privileges the university requires that a university disability parking permit be displayed along with a valid state-issued disability parking placard or state license plate when parked in any disability parking space on campus. The state-issued disability parking placard or license plate will be sufficient at all paid visitor parking areas. 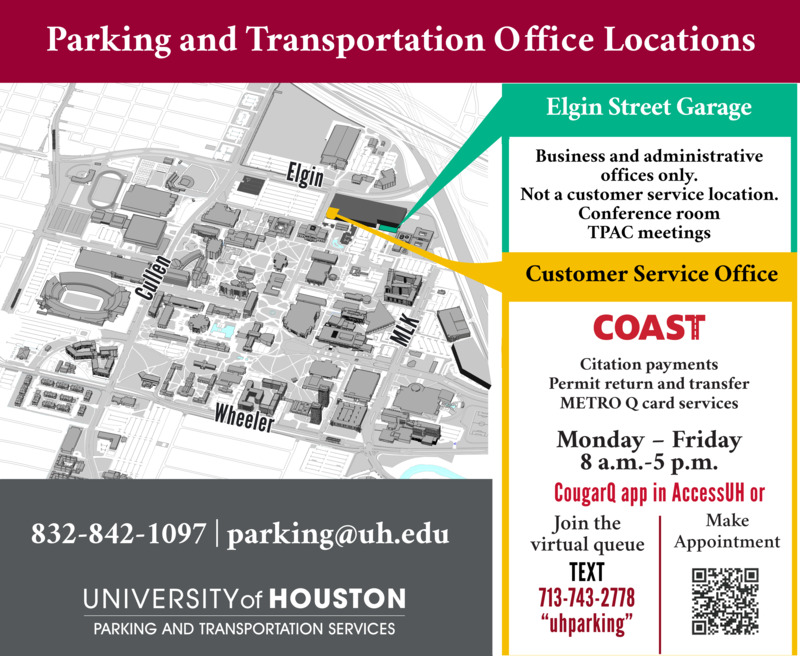 University employees and/or students who have a permanent disability and require a university disability parking permit may either submit the required documents in person at the Welcome Center Parking Garage, or via email to parking@uh.edu. Applicants must complete an Authorization for Accessible Parking form and present a copy of the state placard or a copy of the TX DOT D-12 form with a doctor’s signature or a license plate verification receipt, along with a current driver’s license and Cougar One Card. Disability parking authorization will be valid for the time remaining on the state-issued disabled parking placard or license plate. Re-authorization will be required upon receipt of a new state- issued disabled parking placard or license plate. University permanent disability parking permits must be renewed annually. Faculty/staff and students wishing to renew their UH disability parking permit may do so online through myParking Account at AccessUH, if a copy of their Disability Parking Authorization form is on file. Renewing students may charge the parking fee to their student account and pay it along with their other university charges, or pay via credit card online. Faculty/staff may authorize payroll deduction or pay via credit card online. Those preferring to pay in person must bring their authorization form and completed application to the PTS Customer Services Counter at the Welcome Center or at the Stadium Garage. Students, faculty, or staff who have a temporary disability may request temporary disability parking directly through PTS. A letter from an appropriate physician stating the nature and projected duration of the disability, and the need for disability parking privileges will be required before authorization will be granted. PTS reserves the right to send any applicant to the CSD for further authorization. Disabled visitors not parking in a garage, meter, or gated visitors lot are required to obtain a disability visitor parking permit from the visitor information booth, located on UH Entrance 1 prior to using disability parking. For further information call PTS at 832-842-1097.